|- TAMER HOSNY WITH HAIFA WAHBY AT " CHINESE GARDEN "
On April 27, 2008. Tamer Hosny will be in live concert at " Chinese Garden " with Haifa Wahby . On April 24, 2008. Tamer Hosny will be in live concert at " Algeria ". |- TAMER HOSNY AT " THE AMERICAN UNIVERSITY IN CAIRO "
- Call " 010 66 752 88 ", or " 010 52 666 77 ". Tamer Hosny asked from all the people to help the Operation Smile medical. These people really need a help and even a less help from us will means alot for them. At this clip Tamer's talk about them and asked a help from the people. Tamer Hosny has done from his concert at " Masrah Arena " in Jordan, Amman., and it was so great and the fans was great too. Listen to "Senohy" New Song!! 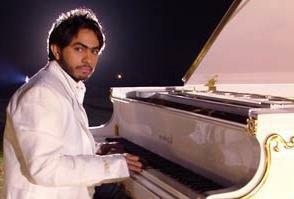 Listen to "Al Azan" by Tamer Hosny. Listen to Tamer's New Song "Habebbtk"
Listen t Tamer's New Arrangement "Bahoon Aleky"